Build your own phone, any way you want it! There is lots of interest and activity in the Silicon Valley Homebrew Mobile Phone Club right now centered around building a phone with a large touch screen. I'm calling it "myPhone", and TuxPhone is the generic name for the open software and hardware components we are using. The hardware design is based on components that are openly available with freely available spec sheets, we will make our schematics, design details and cad files freely available, and its quite likely that no two phones will be built the same way. If you want it thinner and lighter, go for fewer features, a smaller battery and tweak the cad file before making the case. The size is driven primarily by the screen, and we've settled on the screen that is used by the Sony PSP, with a touchscreen overlay added. Its a 4.3" diagonal, and is widely available, low cost. We will include a standard GSM/EDGE module, so I can just pop the SIM card from my Treo into it, and we can add GPS, WiFi, Bluetooth, Accelerometer, SDcards or hard disks, whatever custom mix we feel like. The CPU and other parts will be based on Gumstix modules. Thanks to a comment on my previous open phone post, I am reminded that I forgot to mention OpenMoko. This is a neat looking touch screen Linux phone that should be available in February 2007. I haven't seen one yet, although I have played with the Greenphone and I know someone who has ordered and received a Greenphone, so they are ahead by a couple of months. In the homebrew mobile club, we are talking about making something with a physically bigger (perhaps 3.7" VGA) touch screen than the OpenMoko (2.8" VGA) or Greenphone (smaller QVGA), big enough to show a more usable keyboard. The existence of multiple open phone projects is great, since the nature of the open source community is that we can all share and reuse code for device drivers, user interface components and applications. We aren't building from scratch every time we want a new feature. In the meantime several of us will have Greenphone's, OpenMoko's and TuxPhone's to play with. The big screen is pretty much the most expensive part. I like the concept of building a phone, keeping the screen and CPU for a long time, but do upgrades like replacing the GSM modem with a 3G one by performing electronic surgery inside the case. I've had a TiVo for years now, and Joost has a very nice user interface that works for me like a TiVo that I can run anywhere, and which has tens of terabytes of stored programs, not just the 30GB or whatever that I have inside my TiVo. The other thing that is better than TiVo is the finding experience. I was able to type "Lotus" into a search box, and find two episodes from "5th Gear" where they were track testing my favorite car. The content is largely European TV at present, and they have enough programs to keep beta testers happy for a while, but are going to need a lot more as the program launches. The display quality is good, and there is a short delay when a program is first selected, especially if its one of the more obscure programs. The networking is something like a securely encrypted in-order bittorrent. You don't have to wait for the whole program to load before you start watching it. The final phase in the evolution of a market occurs as the cost of replication and distribution of the product approaches zero. There is no end user cost to use the Internet to download a movie. A central utility such as YouTube can use a mixture of advertising and premium services (for a minority of power users) to offset their own costs. Peer to peer systems distribute the load so that there is no central site and no incremental cost in the system. The only service that is needed is some kind of search, so that peers can find each other's content to exchange it. I was talking about how bittorrent based video is inevitably going to dominate over centralized services like YouTube, and there have been reports that most of the traffic on the internet is bittorrent. The inconvenience of bittorrent is that it is basically an overnight batch job to get a program. Joost fixes the problems of bittorrent, while staying as close as possible to free distribution. Joost inserts a small number of short adverts that the Joost client figures out how to target to your interests. These are intended to be enough to pay for the central seeding servers, and to pay the content owners so good programs become available, without becoming intrusive enough to switch off the users. Based on my own maturity model, Joost is nicely setup to be the end game for this market. That doesn't mean that we stop going to the cinema or watching YouTube, just that Joost could end up being "bittorrent for the masses", and be an order of magnitude bigger than everything else. I just realised that my blog wasn't displaying properly in Internet Explorer. I couldn't figure out why, so I upgraded to a fresh new Blogger.com template that has a lot more configurability, and dropped the ads etc back into it. The formatting is still a bit off, and it looks better in Flock/FireFox but at least the basic blocks are all in the right place now. The archive of old posts is also easier to navigate with the new template. As an antidote to all the grumbling about the lack of an open developers approach to the Apple iPhone I'm going to talk about some projects that are building open phone platforms. I'm a member of the Silicon Valley Homebrew Mobile Phone Club, and there are several projects in existence to create a free, open source, software stack and applications for mobile phones. The hardware parts are available off the shelf, so you can buy a complete open phone or use whatever parts you like. All you need is an enclosure, and you are on your way to whatever spec you wanted, with whatever applications you wanted. Actually, if someone out there knows Autocad and wants to help design some enclosures, the assistance would be appreciated. The SVHMPC often meets at Techshop, where they have a 3D printer that can make anything that can be described by a CAD file in ABS plastic. The phones use off the shelf GSM modems, that take a SIM card and deal with the network. They operate like any unlocked phone would work, and the GSM modem module prevents anything bad from happening to the network. The command set looks a lot like the old hayes modem AT codes, and Linux device drivers exist to manage some of the common ones. Some of the GSM modems include GPS location services as well, most of them are based on the relatively slow GPRS/EDGE standards for Internet connections. My own ideal phone starts with a 3.7" VGA resolution touch screen and includes WiFi, bluetooth GPS and a 3G network, but I may have to put up with GPRS for now. The CPU is based on 400MHz ARM chips from Gumstix, and the parts list from the OpenCell project gives you some idea of what's available. Its going to cost more than an iPhone, won't be as thin, and as cute, but I will be able to make it do whatever I want, and it will be runing as much of the standard Linux 2.6 distribution as I feel like. What the iPhone doesn't do (yet) and thoughts on why not. There has been a lot of commentary, complaints and opinions on the iPhone. I haven't seen much discussion of its features and strategy from the perspective of the realities of product development. In my opinion, what Apple have done is the right set of strategic and tactical moves for the first product in a new family. What was announced and shown is not the final feature set for the initial device and it does not include the full vision of the product. Lets look at the timing of the announcement. As a new entrant in the mobile phone marketplace, the correct strategy is to pre-announce. There is no existing product from Apple to cannibalize, and there is only partial overlap with the iPod market. The announcement was made after the holiday shopping season, and the timing is setup to get a volume ramp in place for the 2007 holiday shopping season. The initial launch is based on the minimum marketable features (MMF) required to address the Apple oriented consumer marketplace. Rather than wait until the full feature set is ready or create low quality solutions for a wide feature set, the Apple strategy is to develop a small number of features to an extremely high level of quality and integration, and focus on the needs of their core market of existing OSX and iPod users. Lets look at disclosure related issues. For a phone to be released as a product it has to go through FCC testing that takes a month or two, and the FCC process is relatively open. All the new phones are scooped by Engadget Mobile before they turn up in stores. For the big splash product announcement, it needed to be scheduled before Apple turns over an iPhone to the FCC test process. In order to keep details on the product quiet for as long as possible, it is also much easier to do the initial launch before completing negotiations with key third party application developers like Adobe and Microsoft. I've heard that there is no Adobe Flash support in the device at present, and there is a clear need to support Microsoft Office at some point in the future. These omissions are easily fixed, its just a matter of time. New models in the iPod range are announced when they are basically in stock in the stores. If you take the iPhone package, and remove the phone parts, keeping the iTunes music and video functionality, and WiFi/web connectivity, you are left with a very nice looking wide-screen networked iPod. Its main issue would be the relatively small capacity flash, so that could be increased, or a hard disk could possibly be crammed into the package. I would not expect anything like this to be announced until it is completely ready and in-stock, but if it exists, it could end up being released this summer around the same time as the iPhone actually ships. Since it isn't a phone, its outside the Cingular agreement, but adding a WiFi only VOIP client like iChat or Skype would create a product that competes with the Sony Mylo. During the demo's no-one tried to show the iPhone's camera, this indicates to me that it isn't finished, and I hear elsewhere that they are still working on video capture. For use as a video-phone, the camera is on the wrong side, you can't see the display while you are on-camera. This makes it seem less likely that a full iChat function will be included in the initial package. Apple is getting a lot of criticism for its locked down and controlled approach to third party software on the iPhone, and lack of a developers program. Developer support falls outside the minimum marketable features required for initial launch into the consumer marketplace. By taking full control of the product, Apple can make sure that very high quality standards are in place, and that applications integrate with the iPhone experience. The reality of product development also makes it hard to build a stable developer API until the product is finished, so I fully expect a phased developer program. The initial phase included applications like Google Maps and Cingular Visual Voicemail from development partners (and I expect some kind of GPS location service to appear in the product soon - perhaps even in the initial release). The second phase will be a closed private developer program including big partners like Microsoft and Adobe. The third phase will start to open up to the Apple developer community, with stable public APIs and developer tools. Extensibility is a MMF for the professional/consumer (prosumer) and enterprise marketplaces, along with Microsoft Office support. This may take a year or so to arrive, its inevitable, but I can see why its not a feature of the initial product launch. There has also been a lot of grumbling about Cingular and the lack of 3G service. Apple have dropped hints that they will support 3G sooner rather than later. My guess is that 3G is considered an MMF for the European and Asian markets, so I wouldn't be surprised if the models launched in those markets in late 2007 and 2008 included 3G support, and as Cingular's own 3G network continues to roll out over the USA the timing would make sense here as well. The real alternative to Cingular for Apple would be to setup their own Mobile Virtual Network Operator (MVNO) like Helio or Virgin Mobile. This is a big complicated thing to do without any experience, so my guess is that they decided that the highest priority was to get the product launched with a big network partner like Cingular, and to decide later on whether it is worth creating an MVNO for a less compromised product. So when the exclusivity arrangement with Cingular expires, they may well focus on their own MVNO services. So thats my opinion, as someone who has developed products and strategies in the past and understands the compromises, but with no inside information on their actual plans. My own plan is to avoid the initial release, and see what the product looks like for the Xmas 2007 shopping season. 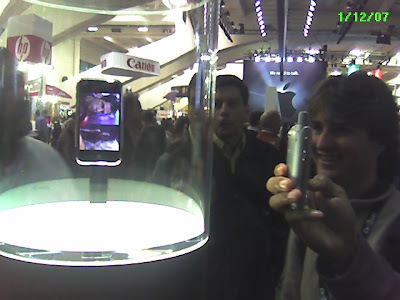 I went to MacWorld to check out the Apple iPhone. I think that it is even more impressive in person than I was expecting. Its smaller and much thinner than I imagined from looking at pictures, and watching the live on-stage demos made it clear just how much of a step forward in usability this is for a mobile device. I took the picture above using my Treo650 of someone else taking a picture with a Treo650, so the size can easily be compared. I was embarrased to get the Treo out anywhere near the iPhone, it just felt wrong. The overall width and length of the device is similar, but the Treo is about twice as thick. I tried to take a picture edge-ways to show how thin the iPhone is, but the Treo camera is a crappy low resolution one and the iPhone is so thin it effectively disappeared in the photo. Like everyone else, I think it looks great. The big difference between Apple and other vendors for just about everything they make is craftsmanship, everything else looks sloppy in design and execution in comparison. So the questions, they really are around whether this is really a pocket OSX machine or a locked down phone that happens to use some parts of OSX. How much memory is there for running applications? The 8GB Flash is basically filesystem space, so there must be some RAM as well. Is it open for more applications to be loaded? For example Firefox, Skype, Slingplayer, OSX Terminal, whatever..... or is it locked down? What is the model for developers to extend the platform? Anyway, next year's Xmas present request list will have one of these on it! As an existing Treo650 user, the discussion on the iPhone at TreoCentral is very interesting. They imply that the CPU is an ARM architecture with an additional graphics processor, and that the iPhone is closed and controlled so you can't add applications to it. We'll see how long that lasts, either Apple will open it up or the hackers will have a lot of fun working out how to crack the design, just like they did for the games consoles, TiVo etc. We have a very sunny high altitude microclimate, on top of the Santa Cruz mountains with a south facing roof. It seems ideal, but the economics are quite dependent on how much Sun we actually get. We called up some local solar power companies to get an idea of what would be involved, but in the short term we decided that it would be good to measure our local weather. I've been using the Weather Underground web site for a while, to track actual local conditions such as wind speed at a station a few miles away. This site contains all you need to know about setting up your own station, and there is plenty of low cost hardware and software to do it. I think the amount of technology available for the price is amazing. I picked the Oregon Scientific WMR100 wireless weather station. It comes with a full set of sensors for temperature, humidity, barometric pressure, rainfall, wind speed and direction, that connect to the base station via wireless. It has a USB connection for uploading to a PC. List price is over $200, but I bought it on eBay for $129.99+18 shipping, which was the best overall deal at the time. I plan to add the optional UV sensor to get an indication of Sunlight (the UV sensor for this model is not yet available, I got an answer that it should be out in a couple of months), and monitor two temperature sensors, one in the shade, and one in full sunlight. I should be able to figure out which days are clear and sunny, and for how long. It arrived, I corrected a few details about the product features above, and I've assembled it and got the sensors to connect over the wireless, ready to install outside. Its nicely made, everything seems to work fine. As I mentioned before, we got a Slingbox AV this Xmas, and I'm quite impressed. It was easy to setup, has been no trouble since, and now we can watch and control our TiVo from anywhere. The main use we have is to watch programs we have saved on our TiVo from anywhere in the house, and it runs a full TV resolution feed that uses a few Mbit/s to support this on our WiFi based laptop's. When running on a work PC laptop (Dell Inspiron with XP) the performance was very smooth, however on my three year old Apple Powerbook G4 I'm down on CPU power and running a beta-version of the Sling player that seems to need some more tuning. If I kill just about everything else on the Mac, it plays fairly well, but the picture keeps stalling if anything else is running.